It takes a lot of pack everything about a character into an action figure, but Disney have tried with these new Solo: A Star Wars Story figurines. The four figures, exclusively revealed by io9, showcase some of the film's brightest stars and, not only are they super-detailed, they all look… a little preoccupied with something else. What could they be thinking? "Not a hair out of place"
First up, here’s Han. Sure, he looks suave but he’s really a little confused about the man behind the camera. Ron Howard, they call him. He’s just unsure about what happened to those two other guys – and if his left ankle might shatter if he holds that pose for too much longer. "Everybody's a gangster until a real gangster walks in the room"
Lando, though… Man, he’s a looker. Look at him, all smug and smarmy. I haven’t seen a toy look that darn cocksure since that pink bear thing from Toy Story 3. 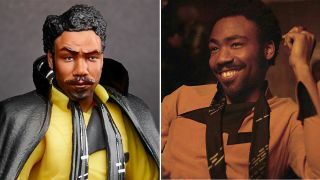 Speaking of tearjerkers, Donald Glover must be over the moon about this, since his first toy was a Lando action figure. Anyhoo, a picture paints a thousand words, right? But those eyes tell us so much more. They scream “I’m totally going to steal your ship.” Not sure about the cape, mind. It looks like an office worker rolled in at 9am with a rush-job Dracula outfit. Lando thinks the same way, judging by that raised eyebrow. "Talk about a pain in the neck..."
"Remember to duck, remember to duck, remember to duck..."
Last but, well, definitely least is the brand-new Snowtrooper. I’m going to call him Bill. Bill isn’t happy with HR’s new directive that he can only clean his armour when his shift is over. He’s spilled a meatball sub all down his, uhh, nether regions, and it’s really left a mark all over his chestplate and pants. At least he won’t be hitting his head on any doors like a certain infamous trooper! For less plastic, more fantastic, be sure to scope out the list of upcoming Star Wars movies. May the Force (to avoid spoilers) be with you.